Vinyl Digital Exclusive: Limited edition of 300 copies on green transparent vinyl! 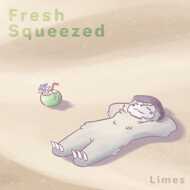 Phat record from Canadian hip hop producer Limes comes “Fresh Squeezed” on vinyl! A perfect mixture for almost every occasion: Some beats start slow, sensual and then build up into way more. You can listen to these jazz fusion influenced tunes on a lazy Saturday morning as well as to really get started for a party night. Something to dance, to relax or to get emotional at the same time. The delicate piano sounds in combination with the very catchy beats just build a perfect symbiosis and fill each of the tracks with their very own purpose and meaning – from happy to romantic.